The John Hardy Classic Chain collection includes a chain motif that is hand-woven, link by link, and annealed for a smooth and supple shape. You'll love how this glittering pave diamond pendanttrimmed with the collection's signature chaincatches the light and illuminates your face. 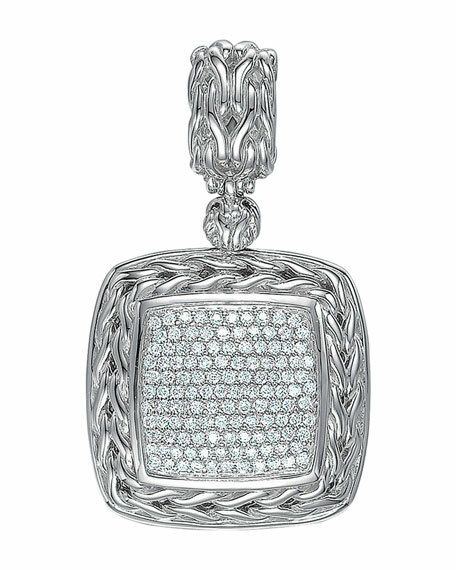 Pave diamonds set in sterling silver form square pendant. Signature woven chain trim and bale clasp. 0.85 total diamond carat weight. Pendant approximately 1 1/2""H x 1"W.
Please note: Chain, shown, is sold separately.John Hardy is one of the last companies to weavechain by hand, and the Classic Chain collectionreflects the brand's commitment to thepreservation of traditional Balinese jewelrymaking techniques. Meticulously weavingthe chain by hand allows a smooth andsupple drape that follows the contour ofthe body. Designed in 18-karat gold, sterlingsilver, and an array of stones. Dina Mackney mixed stone pendant. 18-karat yellow gold plated hardware. Bezel-set round and square stones. Citrine, topaz and Italian glass. Dina Mackney mixed stone pendant. 18-karat yellow gold plated hardware. Bezel-set round and square stones. Citrine, topaz and Italian glass. Hinged bale; approx. 0.50"L. Approx. 1.5"L x 1.5"W drop.